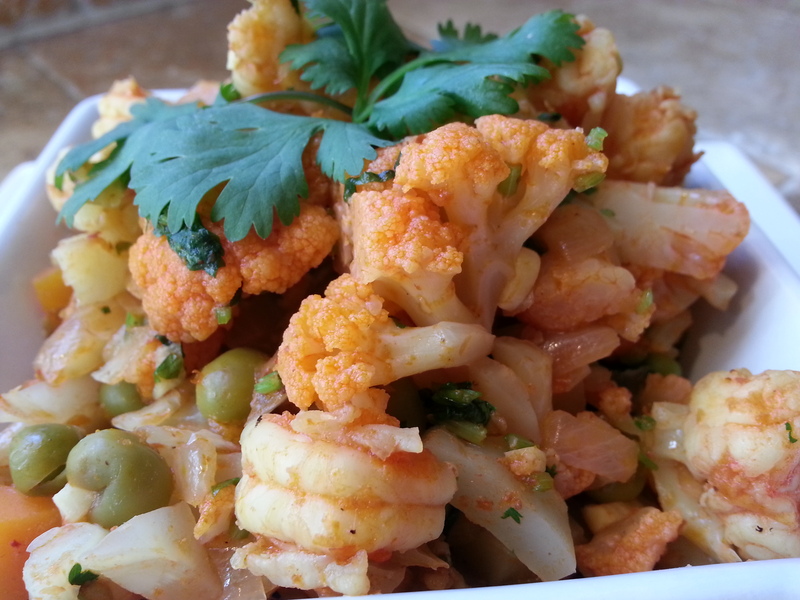 Most of us eat cauliflower steamed or maybe grilled but this Cauliflower and Shrimps Recheado Recipe is a great way to enjoy a simple vegetable, fancy. Recheado Masala is a very popular spice mix for seafood in Goa. It is made by grinding ginger, garlic, red chilli, turmeric ,tamarind and spices in coconut vinegar. It is mostly used to stuff mackerel, pomfret fish and fried, or for shrimp stuffed calamari and many more goan food recipes. This was a popular dish in our home on Friday’s since we did not eat meat. It’s a great recipe either for weekdays or weekend as it does not take too long to make it. You can have it with just plain rice or bread. Apply salt and 1/2 tbsp of recheado spice to the shrimps and keep aside. Heat oil add cut onions and saute till light brown. Add the remaining 1 tbsp of recheado, if u like it really spicy you can add 1 tbsp more. Saute for 1 to 2 minutes. 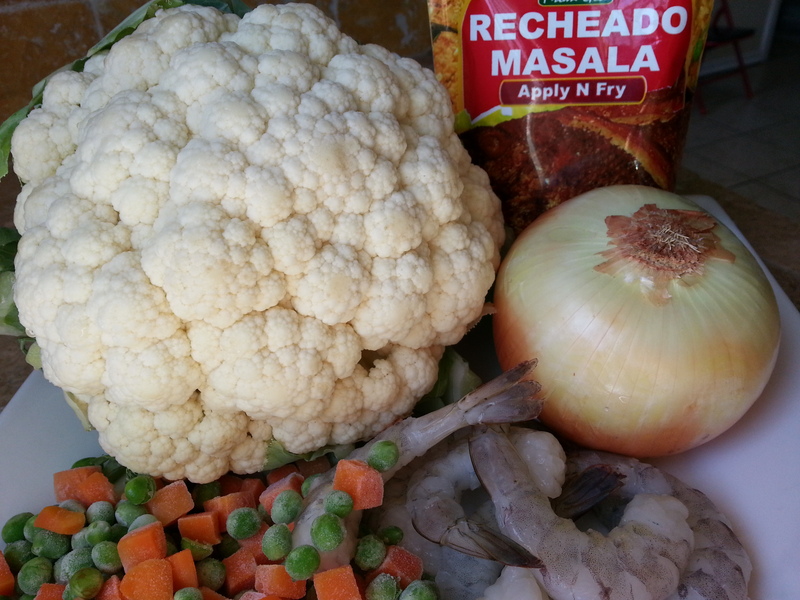 Add the cauliflower, peas and carrots and water, cook covered on medium heat till its cooked. Add the shrimps and salt to taste. Stir and cook for couple more minutes till the shrimps are done. Add chopped cilantro. If you are a vegetarian or a vegan replace the shrimps with tofu. Have been reading through your blog. Really great and easy recipes to try out. I picked up a couple of packets of your spices when I was in Goa on a family vacation last year.. But they do not seem to be available in Delhi. Now with so many e-grocery portals operating all over India, do see if you can place your products with them. So thise of us who stay away from Goa can enjoy your products! I am happy to know that Sanchita 🙂 . And Thank You for the recommendations. it looks great! I’ve always loved cauliflower but haven’t tried many recipes with it! I’ll definitely give it a go! Looks great. I’ll try it this weekend. This looks delicious! My whole family loves shrimp, I bet this would be a hit! Thanks Foodie in WV for visiting mysite, I really hope you do. Looks so delicious! Nice recipe, great photo! Thank you !! Love the way you use arrows to point out your illustrations. Thanks Shanna, I enjoyed reading your blog and your gluten-free recipes. Also thanks for the follow.